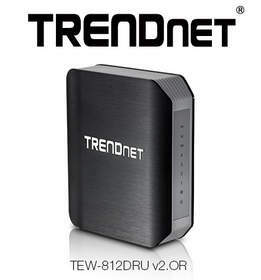 TORRANCE, CA--(Marketwired - Nov 21, 2013) - TRENDnet, a best-in-class wired and wireless networking hardware brand, today announces upgrades to the award winning AC1750 Dual Band Wireless Router, model TEW-812DRU. PC World awarded TRENDnet's TEW-812DRU with its coveted Editor's Choice award. TRENDnet further upgraded the router's award winning long range performance. For clear line of sight connections to the router at distances greater than 50 feet, users can experience performance increases as high as 100% as compared to the first version of the TEW-812DRU. The router's USB port was upgraded to SuperSpeed USB 3.0 which supports 5 Gbps speeds. The new USB 3.0 port will not bottleneck transfer speeds from either a wired or wireless client. For your security the TEW-812DRU's wireless networks and management interface are pre-encrypted with unique passwords -- thereby eliminating the opportunity for hackers to access the device using unchanged default login credentials. The new management interface quickly provides users with key information. Upon logging in, the router summarizes: wireless network setup and respective wireless encryption; internet connection status; guest network status; parental controls; and displays current connected devices. "A good thing is getting even better," said Zak Wood, director of global marketing of TRENDnet. "We had an opportunity to significantly improve one of our most awarded and popular Wireless AC routers and we took it. The TEW-812DRU is faster and more user friendly."